Are You Sure I’m Almost a Senior? I promise you that just last year I was moving into a college dorm for the first time, trying to decide on a major and making new friends. Or maybe I was back for round two, just starting to get the hang of things, making some really good friends and even spending a semester abroad at Loyola’s John Felice Rome Center. Okay, Okay then I’ve only just begun year three, finally getting to move off-campus, am excited about my major and am embracing being an upperclassman. But there’s no way I’m almost a senior. For the past three years I’ve been calling Chicago and Loyola home. These years have felt like some of the fastest of my life. As they say, ‘Time flies when you’re having fun!’ Which I would say has been exactly the case for me. Sure, I’ve faced my fair share of stresses and hardships during my college experience, but honestly I wouldn’t take any of it back. My junior year has been especially good to me. I’ve finally chosen a major that I’m excited about in Public Relations and am looking forward to another year of classes at the School of Communication. And thanks to some inspiration from a favorite Loyola professor of mine, I’ve also added a Marketing minor. My classes this year have pushed me academically, made me a better writer and helped shape my worldview. This year I’ve experienced the most personal growth yet, academically, spiritually and in my relationships, for which I am truly grateful. 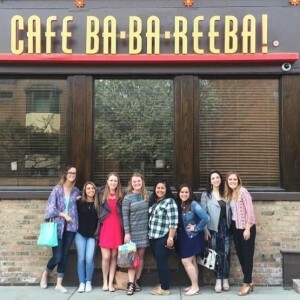 My college experience has been completely different than what my freshman-self would have expected and everything my (almost) senior-self could hope for. I’m not sure what this next year will bring or what will follow, but I think I’ll have a hard time topping my junior year at LUC. So I guess that after looking back on it all again, it does seem like it’s time for me to be a senior. Even if I’m not quite ready to admit it. Well, technically they only fed me twice. This was a busy week at the School of Communication. In true college student fashion, I took advantage of opportunities for free food, which meant I ended up attending some really special on-campus events. The first was on Monday evening. 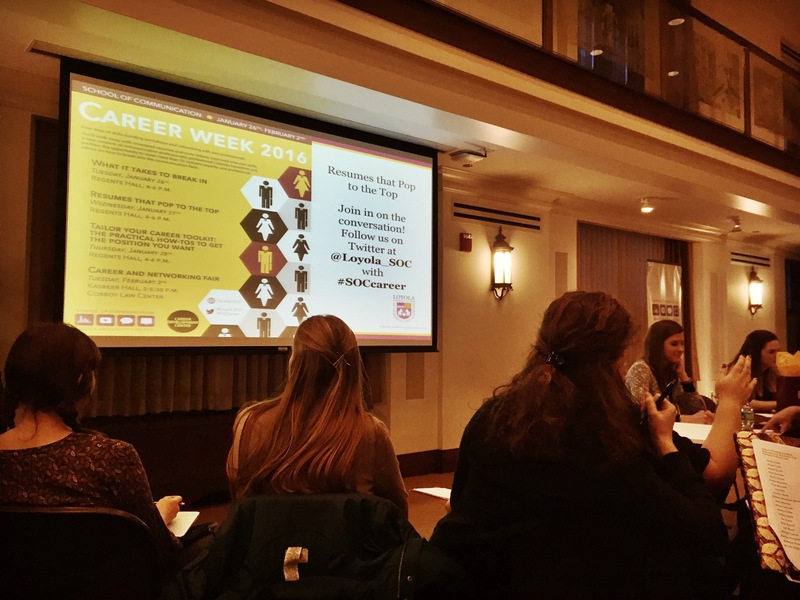 A networking reception was held for students in the Advertising and Public Relations program, alum from the program and professionals in the industry. 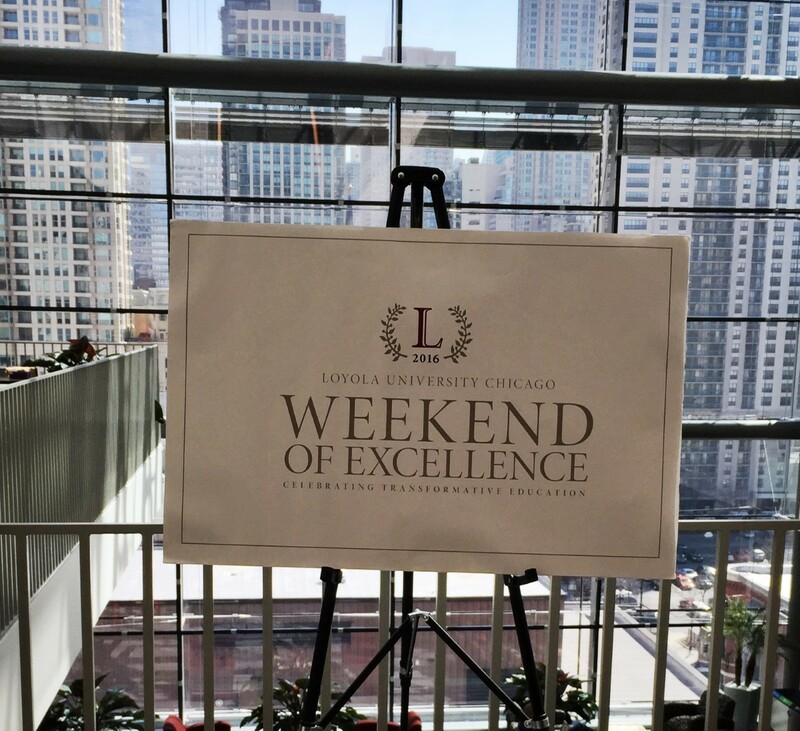 Many of the professionals are people working at the companies where Loyola students intern, providing the perfect opportunity to network and scope out potential internships. This hors d’oeuvres and cocktail hour was held at our Water Tower Campus on the 15th floor of the Corboy Law Center. This venue provides breathtaking views of the city and exactly the right atmosphere for the occasion. I had the opportunity to chat with several of my professors and two Loyola alum who now work in the city, who I’m looking forward to getting to know. Next semester I’ll be looking for an internship, so hopefully these connections can help get me on the right track! 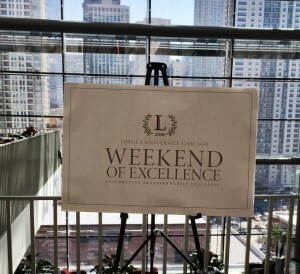 Friday marked the beginning of Loyola’s Weekend of Excellence, and my second chance for a free meal. I was honored to attend the SOC Honors Ceremony and Student Showcase on Friday afternoon. This ceremony involved a formal presentation of several awards and recognition for different student honors. The awards presented included, Outstanding Major Awards (a winning student was selected from each major within the School of Communication), Top Original Student Work and and an SOC Teaching Award. Students were then honored for graduating from the university’s honors program, for receiving scholarships and new members to the Beta Rho Honors Society were inducted into the organization (that’s were I came in). Students within the School of Communication are truly producing some incredible work and I’m excited to be a part of a school that is pushing their students toward such excellence. I truly cannot believe that my sophomore year is virtually over! I cannot wait for finals to come and go, but I anticipate continuing to find my calling and my way with the time I have left at Loyola University Chicago. I now will be advised through the School of Communication, so I can have the guidance and perspective of those that are active in the field in regards to questions and concerns I have about anything. This year was very stressful, but very rewarding. While pushing myself to improve my grades and enroll in challenging courses, I was able to balance academics with activities that I am passionate about. I am excited to continue the work I have done to build community on this campus, and I am also excited to explore what more I can do! On Tuesday, my classmates from my media law class and myself attended a free media law workshop that was hosted by the Reporters Committee for Freedom of the Press (RCFP) and the School of Communication. The workshop covered gaining access to court records and proceedings. The RCFP has provided free legal advice, resources, support and advocacy to protect the First Amendment and Freedom of Information rights of journalists working in areas where U.S. law applies. Representatives from the RCFP provided a folder full of vital information for journalists in regards to how to access public federal records and the Illinois reporter’s privilege. I will definitely keep this safe for future use. It was really interesting and thought-provoking to hear what was shared at this workshop because not only does this help me remember what I have learned in my media law class, it shows that this will be of importance to me in my future career as a journalist. In regards to that thought, I also think about how opportunities like these are so important for my development and perspective. The School of Communication has been very adamant in providing opportunities to have students and people in the field come together and have these conversations. 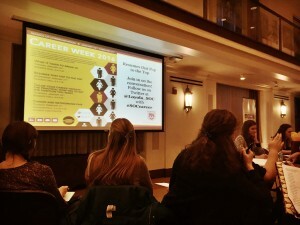 On Tuesday, I took the opportunity to attend an event that the Loyola University Chicago School of Communication and the Chicago Headline Club hosted on the effects trauma has on journalists. The panel discussion included Jeff Kelly Lowenstein, Julie Lieblich and Dr. Frank Ochberg, all of the DART Society. The event was moderated by Randi Belisomo of WGN. The discussion was very informative for me, as an aspiring journalist because they explained the four stages of Post Traumatic Stress Disorder, and how this condition can effect the work and well being of journalists. Some of the journalists on the panel, have been in the field so they gave advice and recommendations as to how to deal with reporting stories on traumatic events. The discussion also covered how to handle the grief of the subject and the grief of journalists themselves, when to know to stop the story if the subject would not like to continue and to be open to sharing and talking about traumatic experiences on the field with others. An important lesson that I took out of this event was to enter a place of gratitude and humility whenever I am covering a story on traumatic events and interviewing victims. I also learned that journalists cannot protect victims from the aftermath of a traumatic event. I really appreciate an event like this, especially since I am learning the realities of a field that I seek to enter into. I definitely plan on looking into experiences like this and what else I will face as a journalist.